I had the chance to travel back to France during Spring Break, for some much-needed down time. While lugging around my laptop, purse, and various travel items, I thought about the Zuca backpacks and how perfect they would be for travel. Unfortunately, they’re not so great at school. Prior to the break, when Kate first announced that Zuca backpacks were to be prohibited at ISTP, I have to admit, I didn’t quite understand the problem. I knew they were an eyesore, clutter the hallways, and have people tripping or walking over them. But, prohibit them? Those of you who know me well also know that my curiosity often leads me to try things out myself... I won’t necessarily take someone’s word for it. I even went so far as to go in the hallway and try to shove the backpacks into the cubbies to force them to fit. 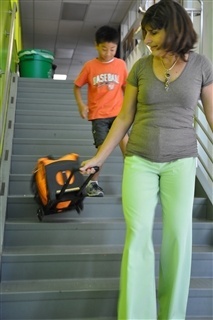 After the announcement, I noticed a 4th grade student trying to get her Zuca backpack down the stairs. She was also helping her friend, who was having difficulty getting her Zuca down the stairs; she literally could not carry it herself. I stopped them to ask questions about their backpacks. The student patiently demonstrated to me that if you didn't want to carry it, how you have to angle your body and your arm a certain way in order for the backpacks to roll down the stairs properly. I was surprised to find that although I am an active adult, even I had difficulty doing this "properly"! I can’t imagine how much more difficult it is for children. The next day, I wanted to see how the Zucas affected key times like pick-up. I suppose I had never noticed before, but the Zucas actually slow down the dismissal. If you try to do it properly, you use up a lot of valuable staircase space. I saw students trying to lug them with one hand, tilting their bodies so far the other way to get leverage to lift them. 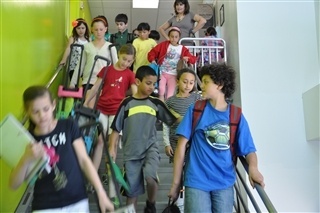 Also, when you have that many students trying to get down a staircase, with the space they need behind them to lug, drag, or roll their Zuca... I very clearly saw how this is a recipe for disaster. It only takes one student to let their heavy Zuca slip, and you can imagine the domino effect. Helping another student down a staircase with his backpack made me realize that Kate’s right. These bags were made for travel, and not necessarily appropriate for our school. As always, feel free to email me with your comments and thoughts.